I found the recipe for this garlicky dish over at Kara's Kitchen Creations, which is one of my favorite places to find new recipes. 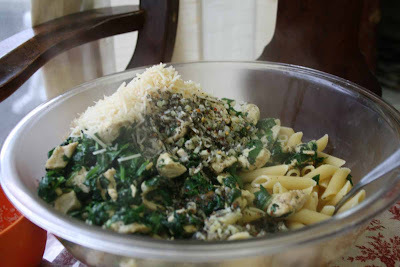 The garlic and Parmesan cheese gave it its amazing flavor and the pasta and chicken made it instantly likable to the kids, despite the presence of the green spinach. This is an easy-to-make main dish that is definitely staying in our keeper files! Heat olive oil, garlic, and red pepper flakes in a small glass bowl in the microwave for about 1 minute to blend flavors. 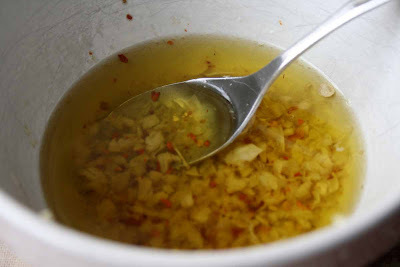 Pour about 1 tablespoon of the flavored oil in a skillet. 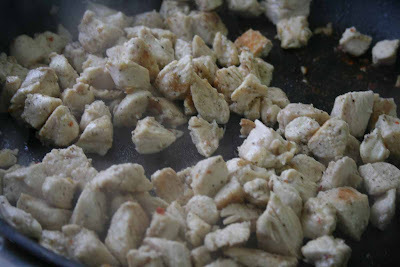 Salt and pepper chicken and cook in the oil over medium high heat until chicken is browned and juices run clear. 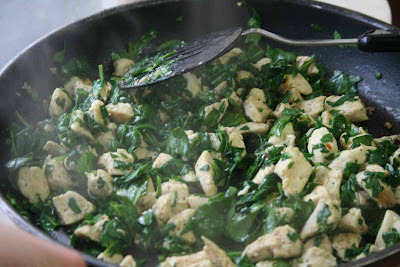 Add the chopped and spinach and saute with the cooked chicken for 1 minute (or until just barely wilted) and remove from heat. Meanwhile, cook pasta as directed on package; drain well. 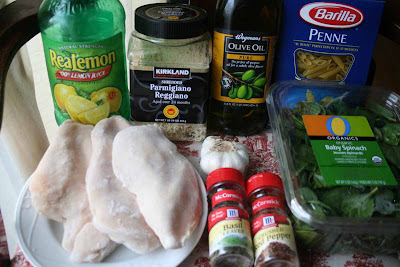 Add cooked chicken/spinach to pasta, along with basil, lemon juice, and Parmesan cheese. Then stir in the remainder of the flavored olive oil. Toss lightly until all ingredients are well-combined. Serve immediately. Makes about 6 servings. Enjoy! mmm... This one's going on my menu this week! Any recipe that starts with the word "garlic" is a keeper in my book! ooooh, how yummy! i can practically taste it now! What a great weeknight recipe for the spring - I must try this. 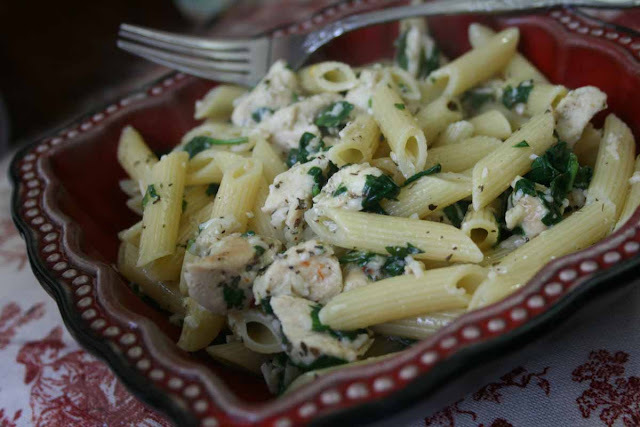 Chicken and pasta dishes are my favorite. This looks great. I think I'll add even more garlic! I made this for dinner tonight and it was a HUGE hit! Both my husband and son said it tasted like it came from a restaurant. I will be making this again for sure! Thanks for posting. I made this tonight and it is WONDERFUL. So full of flavor and nutrition!! Thank you for all your recipes. This has turned out to be my favorite dinner to make and eat. It's so dang good. I just made this for dinner tonight and it was incredible! My 4 and 2 year olds loved it as well. I've made so many recipes from your blog and they have all turned out amazing! O.K, I am not much of a spinach kinda girl! I don't like green veggies much at all, but after recently becoming preggers I am trying to eat healthier. This recipe made it easy to eat my veggies! Delicious! I will be making it again for sure! So I made this the other night and really enjoyed it. Hailey said she didn't like the spinach which is weird because she loves spinach. Oh and I added portobello mushrooms to it. It was yummy. This was a hit! Somehow spinach didn't end up on my grocery list app so hubby didn't get it, so that was the only ingredient I didn't use. We had an extra child eating with us and it was a success! We had PLENTY to eat and 2 of the kiddos went for thirds! 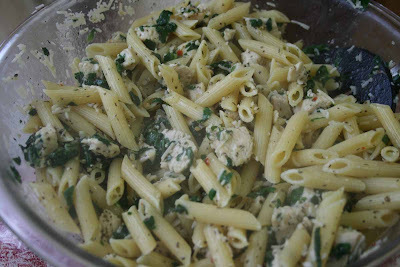 Hubby loved it and said this is a definite must make again! Thanks for sharing!! I make dinner for four familiues on Tuesdays and they all loved it. It was easy to make too!!! Thanks again! !